North Atlantic Books, 9781583947623, 592pp. ROBIN ROSE BENNETT is a compassionate, empowering herbalist and spiritual teacher. The focus of her healing work is to share the generosity of the earth and the magic, mystery, and beauty of the web of life. Since 1986 she has taught at schools, clinics, progressive and holistic organizations, herbal conferences, and is a repeat guest lecturer at Albert Einstein College of Medicine, St John's Hospital, Montefiore Teaching Hospital, Beth Israel's Nursing program, and Brown University Medical School. She is a faculty member of the New York Open Center and author of two meditation CDs. Bennett has a private consultation practice in New Jersey, offered on a sliding-scale, and an herbalist-in-residence teaching practice at a family medical practice in Bronx, NY. She is a long-time member of United Plant Savers and the Northeast Herbal Association. Robin writes regularly for Plant Healer Magazine and is proud to be a founding member and on the board of directors of SustainableWestMilford.org. Hundreds of apprentices have graduated from her 3-year, in-depth apprenticeship programs over the past 25 years and thousands of students have benefitted from her regular classes as well as free classes that she regularly offers in her town as a community service. The author lives in Hewitt, New Jersey. "A treasure of well-lived stories and well-loved recipes... 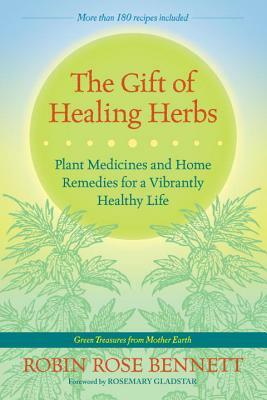 This book is useful for beginners looking for solid information and easy-to-find supplies and techniques that will start them on a safe path with healing herbs. Seasoned practitioners also will find great value from the author's years of experience and her mastery of food and plant medicine... The plethora of beautiful recipes, healing stories, and decades of work as a community herbalist certainly make this book a success." "An herbal written by a practicing herbalist—filled with practical hints and helps for you. Destined to become a classic, Robin Rose Bennett's new book is a delicious quaff."